TIP: Serving suggestion; remove the thighs and vegetables from the pan. Add 1 tbsp butter to the pan juices and reduce until thickened, 8 – 12 minutes. Slice the turkey off the bone and serve with the peppers and onions over rice, noodles or mashed potatoes. Top with the pan sauce and fresh parsley. 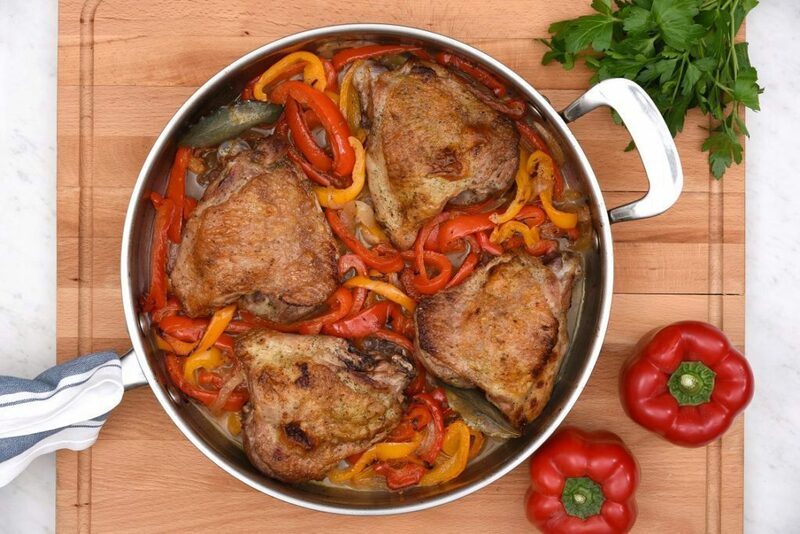 Heat olive oil over medium heat in an oven-proof skillet or frying pan. Brown turkey thighs on both sides until skin is crispy, 5 – 8 minutes per side. Remove turkey from skillet and set aside. Turn heat up to high. Sauté onions and peppers over high heat for 1-2 minutes until lightly browned in spots. Return turkey thighs to the pan. Add spices, bay leaves, turkey broth and wine. Bake for 35 – 45 minutes, until turkey is cooked through and an instant read thermometer inserted into the thickest part of the meat reads 165°F (74°C). Top with fresh parsley and serve.